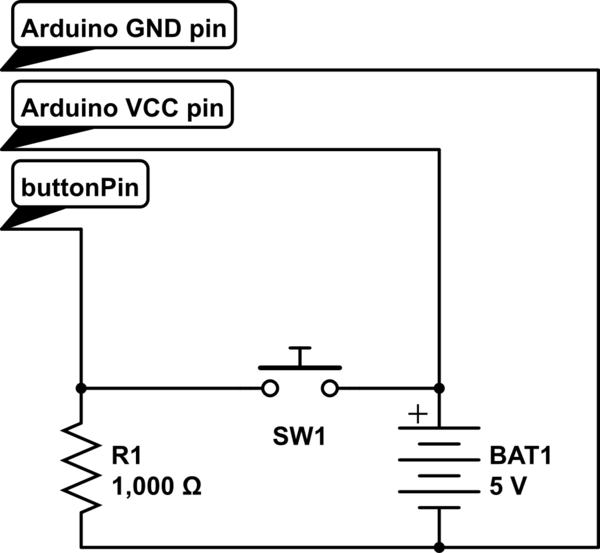 I need a code to pause arduino code untill a button is pressed. I have a long code and at point i need a condition that if a Button on pin A2 is pressed then go forward, otherwise wait. I tried using "If" and condition but it failed for my purpose, because when "IF" detects that the button is not pressed, it moves to next lines (as usual). But i have long code and I want to wait it forever untill the button is pressed. The construct you are looking for is called while. Instead of doing "If the button is pressed then continue" you need to do "while the button is not pressed do nothing". So while it's not pressed (digitalRead(A2) == HIGH) don't do anything. As soon as digitalRead(A2) returns LOW (so it is not == HIGH any more) the while loop will finish and your sketch can continue. Here are two ways you might have wired the button. If you wired it with a pullup, you will need to test for LOW (the button will ground its output when pressed). If pulldown, the button will raise its output when pressed and you would test for HIGH. If you will be testing the button again within less than a second, don't forget to debounce it. Switches send a bunch (technical term :) of pulses for a significant fraction of a second during a make or bread. 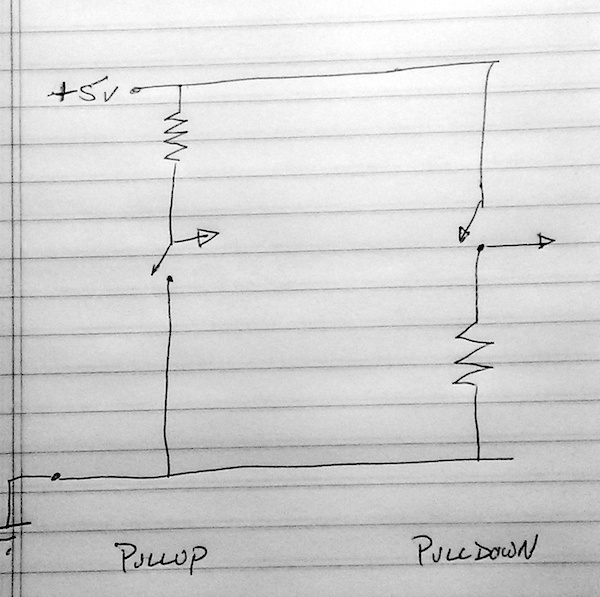 See Nick Gammon's "Switches" page for a thorough discussion. I need a code to pause arduino code until a button is pressed. I wrote a simple function to do this.